June 11, 2018, El Cajon, CA – After a 5th at the San Felipe 250, Black Rhino Sponsored Athlete Cody Rahders plan for the Baja 500 was simple. Start up front, run at 80%, and finish on the box. It started out pretty close to that; Cody and Fernando Ramirez started 3rd, passed second, then first and began to maintain a comfortable pace towards RM77 where they would hand off to to James Hill and Riley McGuiness. They would then take the car to from RM77 to Rm277; unfortunately things did not go as planned. As Hill and McGuiness held the class lead at RM180, an upper front shock bolt failed. Riley walked the course to find the shock spacers and when they went to replace the bolt they discovered the RF upper arm had broken. The car was limped back to RM170 where they found a welder and James Hill welded everything back together and proceeded to re-enter the race in roughly 32nd place. As Hill and McGuiness closed in on RM277 they made up several positions but unfortunately found a large rock at RM260 which caused a left front flat tire. At RM277 the tire was changed, Cody and Fernando got back in the car and the two of them went to work. Going up the Mike Sky Ranch road towards Rancho Melling and ultimately RM405, Cody began to work the field passing 15 cars up over the pass. By the time Cody and Fernando had reached RM470 they were in 13thwith 12th thru 10th one minute in front of them. As they raced towards the finish Cody was in 12th place when disaster stuck in the form of a broken right rear hub. 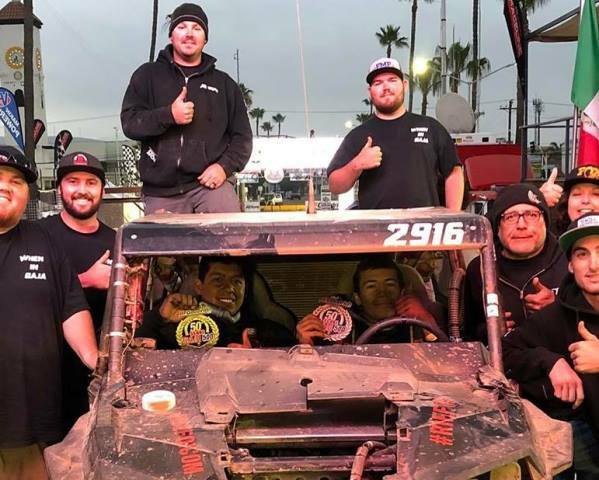 James Hill, Riley McGuiness, and Doug Rahders jumped in a RZR XP4 and drove out to RM497 (in the middle of nowhere) and replaced the hub allowing Cody to finish the Baja 500 in 19H 55M 6S in 19th place. “We cannot thank our sponsors and crew for supporting and chasing us, we love racing Baja.” the team said. Polaris RZR, FOX Racing Shocks, Tensor Tires, Method Race Wheels, K&N Filters, Black Rhino Performance, Sparks Racing, Baja Designs, Energy Coil, IMG Motorsports & RacerX Race Radios. Drivers/Codogs; Fernando Ramirez, Kevin Sullivan, James Hill & Riley McGuiness. Crew; Nick Novak, Fernando Ramirez Sr. Nate Burleson, Matt Reppe, Whiskey Dave, Brandon, Garret, Rasa, and my mom & dad.